Chocolate Tank Build with SS 304, body and doors with duly painted Mild steel. Covered by poly carbonate doors. We are a noteworthy organization in this domain, occupied in providing pristine quality range of Automatic Chocolate Enrobing Machines. 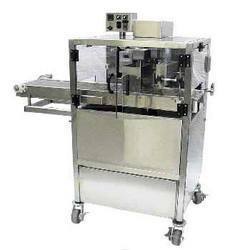 These machines are widely used in the confectionery industry for coating chocolates. Different food stuff, such as candy, cake, wafer, biscuit and fruit etc. The tempering enrobing machine COMPATTA is able to temper, drip, dose and enrobe. 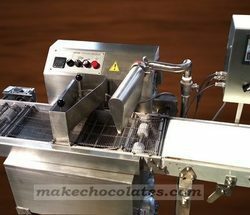 For catering the variegated demands of our respected clients, we are highly engrossed in providing a wide range of Chocolate Enrobing Machine. Trait : This machine can make out the chocolate coated products of special taste and flavor.